As the reflection of a typically volatile live performance of Charles Mingus, Right Now: Live At The Jazz Work Shop is indispensable. By 1964, bassist and composer Charles Mingus had been in the business for two decades, contributing to the bebop revolution and recording landmark albums that stretched the boundaries of mainstream jazz, such as Pithecanthropus Erectus, Mingus Ah Um and Black Saint And The Sinner Lady. In the summer of that year, the beguiling line-up of Mingus’ latest group including reed wizard Eric Dolphy had partly disbanded. Pianist Jaki Byard’s last appearance with Mingus had been in April. Trumpeter Johnny Coles fell ill and Dolphy stayed behind in Berlin after their European tour. (where Dolphy died from a diabetes attack on June 28, three weeks after Mingus recorded Right Now) Of that group, tenorist Clifford Jordan remained alongside the longtime Mingus sidekick on the drums, Danny Richmond. 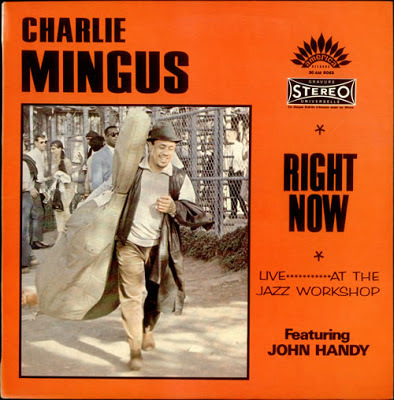 Right Now doesn’t give the impression that Mingus temporarily lacked inspiration because of Dolphy’s and Byard’s absence. On the contrary. New Fables is a reworking of Fables Of Faubles, Mingus’ famous biting protest tune directed against the segregationist governer of Arkansas, Orval E. Faubus. Mingus continued playing the other composition of the album, Meditation On Integration, from the ‘Dolphy’-era, giddily retitled as Meditation (For A Pair Of Wire Cutters). Both tunes cross the 23 minutes line, but keep interesting to the last note. It’s a revealing experience to hear Mingus direct the flow of the music in New Fables through his driving, immaculate bass playing, shifting tempo’s like a madman and pushing the group to segue into and out of themes, wild shuffles, a cappella horn parts and slow blues parts. Tenorist Clifford Jordan is inspired to go well beyond his game and John Handy, who had a history in Mingus groups, puts in a hard-driving mix of bop and blues. Mingus also stokes up the fire with his archetypical, hoarse exhortations that sound like crosses between the fire and brimstone of the altar and the hog call. An equally rousing personality as Mingus, drummer Danny Richmond is integral to the group’s spontaneous combustion. He blends proficiency with intuition and has the guts to veer off track, the road always lead home. Take into account that home, in this case, isn’t your everyday, suburban household. Mingus and Richmond have always been on the same page and their shared energy level on Right Now is absolutely crazy! The way they steer their way through Meditation’s first five minutes from the percussive opening driven by Mingus bowed bass, via a barnstorming swing section to a lovely, warm ballad bit, is breathtaking. And then there’s Jane Getz. No relation to Stan. Not a household name, but a female jazz personality with a peculiar and outstanding career. A child prodigy on piano who’d spent her childhood in Los Angeles, Getz moved to New York when she was 15 and quickly acquainted herself with contemporary leading figures, playing with Pony Pointdexter, Pharoah Sanders, Charles Lloyd, Roland Kirk, Elvin Jones, Stan, yes, Getz, and, eventually, performing with Mingus. Dropping out of the jazz scene when she secured a RCA deal as a session musician and producer in L.A., the seventies and eighties found her working on albums by the likes of John Lennon, Harry Nilsson and The Bee Gees, as well as recording country music as Mother Hen. It was only in the early nineties that she returned to jazz. Getz struck up a fruitful association with saxophonist Dale Fielder (who chronicles the life and career of Getz on his blog here) in 1995, which remains to this day. Thrown into the barnstorm of a Mingus session at the last minute, with a couple of complex charts in front of her ten fingers and eighty-eight keys, Getz fazes the controlled chaos of Mingus couragiously. Her accompaniment is robust and edgy, she puts in some interesting thematic variations behind the soloists. Her transparant, long lines in Meditation bring to mind the modal moods of mid-sixties McCoy Tyner and Herbie Hancock. I’m a sucker for the disturbing ‘banging’ sound of piano, bass and drums that signal new sections in New Fables around the third minute that alludes to modern classical composers such as Edgar Varese. Or maybe they were just trying to blow off the Jazz Workshop’s rooftop. At any rate, although I know I have it coming, it keeps shaking my nervous system time and again in a rather mysterious, euphoric manner. Being hurled into the shredder by The Baron. A recognizable feeling for many jazz fans, I’m sure. The Mosaic label, whose policy of re-issueing and uncovering vaults has been so essential in keeping the flame of classic jazz burning, shed a welcome light last year on tenor saxophonist Clifford Jordan, releasing a box set of six adventurous albums Jordan produced and recorded in the late sixties and early seventies on Strata-East, among them Jordan’s career-defining 1973 album Glass Bead Games. 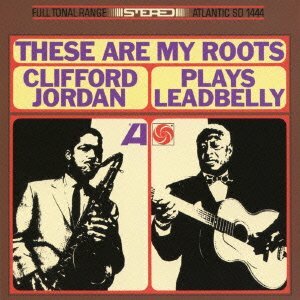 Jordan’s career included other rewarding efforts, like These Are My Roots: Clifford Jordan Plays Leadbelly, Jordan’s sole album on Atlantic. It’s a surprise act, a wicked dedication to the roots of black musical culture. Jordan hailed from Chicago, hometown of hard-driving, so-called ‘tough tenorists’ like Gene Ammons and Eddie ‘Lockjaw’ Davis. While Jordan shared their unnerving bravado, his tone is different, an alluring tone, simultaneously rough around the edges and ephemeral. A sought-after sideman, Jordan recorded with stalwarts as Lee Morgan and Max Roach in the late fifties and early sixties, as well as a series of high standard solo albums. Much acclaimed hard bop favorites are Blowing In From Chicago (Blue Note, 1957, with John Gilmore) and Cliff Craft (Blue Note, 1957) Like age matures wine, Jordan’s style ripened in the early seventies, his lines becoming fluent like ripples of lake water. Jordan kept recording and performing steadily until his death in 1993. Maybe this album, filled with interpretations of such classic tunes as Take This Hammer and Goodnight Irene, is not such a surprise act after all. The preceding year, Jordan had been part of Charles Mingus’ outfit (appearing on the hi-voltage live album Right Now: Live At The Jazz Workshop) Musical gobbler Mingus’ unfazed search for new vistas while retaining an all-embracing sense of the past’s relevance and blend of harmonic finesse with unbridled juke joint tumult surely rubbed off on Jordan. Da Gray Goose is one of the cases in point. Tasteful harmony over the stop-time theme kicks it into action, strongly plucked bass and fiery drums inspire the soloists, creating an atmosphere of abandon. Lusty shout choruses stoke up the fire as the tune progresses. There are also some, yes, virtuoso banjo parts. The gloomy folk blues music of Huddie ‘Leadbelly’ Ledbetter, whose life story reads like a combined effort of Shakespeare and James Baldwin, including oppression, hardship, addiction, treachery, murder and prison life, is excellently cast in a jazz frame. But not too jazzy, often the sound of Jordan’s top-notch group is as tough-as-nails as the sound of any one group that enlivened the back alley bars way back when. Jordan’s unpredictable phrasing overcomes the restrictions of the rigid folk blues form. Craftily uncrafted, These Are My Roots is a spirited album of earnest, raw and ebullient swing. 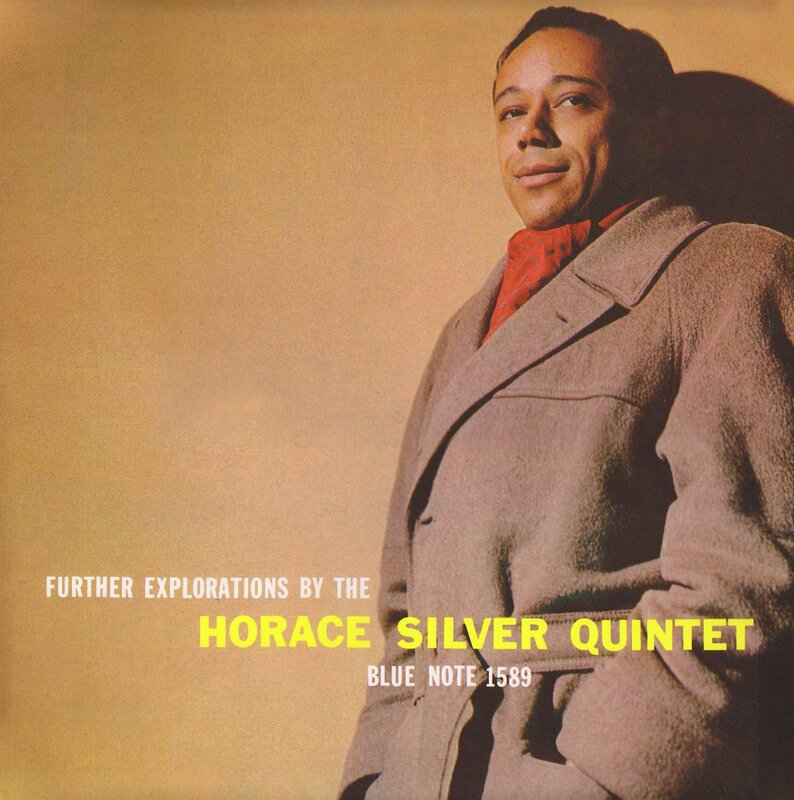 Further Explorations, pianist Horace Silver’s sixth release on Blue Note, is a revealing album in his catalogue. Silver branches out beyond his idiom, further developing tunes with Latin rhythm, the minor key and unusual bar lenghts. Carefully crafted but uncluttered, the album doesn’t stress the down-home feeling Horace Silver incorporated into modern jazz. But Silver’s innovative writing and supreme piano concept make it an extremely rewarding listening experience. The album sits between Stylings Of Silver, which had the same line-up except Hank Mobley instead of Clifford Jordan, and the albums Silver made with his longstanding group from 1959 to 1964, consisting of Blue Mitchell, Junior Cook, Gene Taylor and Roy Brooks. The ensemble playing of the group on Further Explorations is outstanding. Art Farmer contributes elegant solos and his sound is crystalline. Clifford Jordan’s playing, albeit a bit guarded at times, is excellent. The first two cuts make it clear that although Further Explorations is an appropriate title, More Stylings Of Silver would be on the money as well. The Outlaw has unusual bar lenghts, a Latin beat alternating with 4/4 time and labyrinthine stop-time sections, yet moves along swiftly in the manner of early Silver gems such as Room 608. (from Horace Silver And The Jazz Messengers) It’s intricate, but at the same time would still be a credible juke box tune. The second composition, the ballad Melancholy Mood, is a change of mood indeed. It’s a ballad that starts as a warm-hearted duet between Silver and Teddy Kotick, (one of Charlie Parker’s favorite bass players) who plays bowed bass on the Thelonious Monkish-theme. Louis Hayes chimes in with smooth, elevating brushwork. Silver’s solo is a gem, mixing long stretches of brooding minor chords and notes with sensuous phrases and repeated funky licks. Both Pyramid and Moon Rays have perplexing, yet swinging themes. Pyramid is a mix of a catchy melody, Latin tinges and stop-time choruses, wherein Art Farmer finds his way with lyrical, long flowing lines. Moon Rays is the eleven-minute long centre-piece of the album. As counts for all tunes, the melody, again partly Latin, is exasperatingly beautiful. The manner in which Silver’s occasional old-timey lines travel in twisted ways again proofs the influence of Thelonious Monk. The parts of Clifford Jordan and Art Farmer are proficient, but somehow fail to get on the magic bus of Silver’s inventive tune. Jordan and Farmer are much better on Safari, a re-visit of the trio take Silver did with Art Blakey and Gene Ramey on his Blue Note debut Introducing The Horace Silver Trio in 1952. At breakneck speed, Clifford Jordan finally has gotten the real hot blues. Arlen and Koehler’s Ill Wind, the only non-Silver composition on the album, refers to Things Ain’t What They Used To Be with a couple of notes that Silver also uses in his interesting solo. Ill Wind is not the distinctive melody you’d dream up as an ending to the carefully prepared, wonderful set of Silver inventions that comprise Further Explorations.